The gateway supports the CIMD2 (Computer Interface to Machine Distribution, version 2) protocol to connect to an SMSC over the internet or other private TCP/IP network. This protocol is implemented by Nokia SMSCs. To add a CIMD2 connection, select “Add” from the “SMSC” configuration dialog. Then select “CIMD2 over TCP/IP“. “Server Host Name” specifies the TCP/IP address or host name of the CIMD2 server. “Server Port” specifies the TCP/IP port on the CIMD2 server to which the gateway should connect. “User Name” specifies the user name for the gateway to use when connecting to the CIMD2 server. “Password” specifies the password for the gateway to use when connecting to the CIMD2 server. 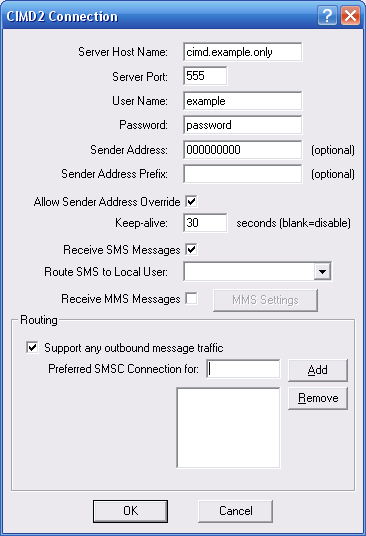 “Sender Address” specifies the default sender address (phone number) to apply to outbound SMS messages. The CIMD2 server may override this setting. Many CIMD2 connections allocate multiple phone numbers to an individual SMSC account. The “Sender Address Prefix” setting specifies the prefix associated with all phone numbers allocated to the SMSC account. Check “Allow Sender Address Override” if you want to allow messages submitted to the gateway to be able to specify a sender address. If this box is checked, and a sender address is present in a message being submitted to a CIMD2 based SMSC, the sender address in the message will be submitted to the SMSC. The CIMD2 server may override this setting. Some CIMD2 servers may require that clients submit keep-alive messages to the server every so many seconds or minutes, or the server will time out the connection. To enable keep-alive messages, specify a value in seconds for the “Keep-Alive” setting. Check the “Enable Receive Messages” box if you wish to receive messages from the CIMD2 server.